Interactive Read Alouds are one of my favorite things to do with my students. 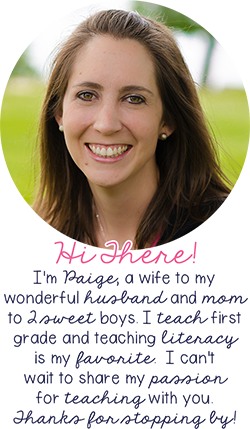 If you follow me on social media or you know my TpT products, you might already know that. I love to talk about them. Do you know what they are? Do you do them with your students? I'm here to help! Read on to learn more about them. 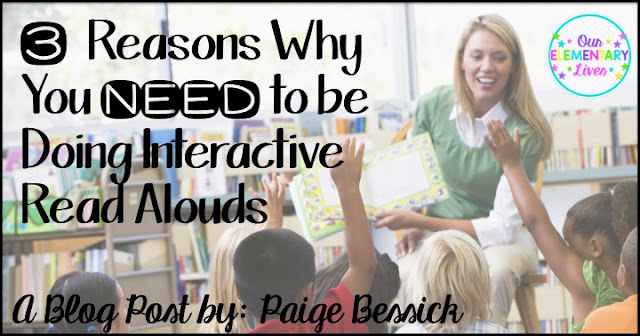 I am going to share with you 3 VERY important reasons why you NEED to be doing Interactive Read Alouds with your students. Interactive read aloud (IRA) is a time set aside by teachers to orally read, think about and discuss a book at a student’s listening level. These books are often above the independent reading level of students, but they are able to listen and comprehend. It is a purposeful read aloud time. It is a time to demonstrate to students how to actively engage with texts by showing them how to search for meaning, introduce reading strategies and create meaningful discussion. They often include asking questions and discussions before, during and after reading to improve comprehension and understanding. No matter what grade you teach, you should be reading aloud to your students EVERY DAY! Depending on your grade, you can take almost any book at your student's listening level and create grade-level appropriate questions and discussion points. 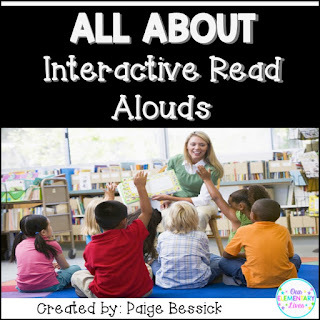 While not every read aloud you do should be interactive, it is important to do them several times a week. Many times it is a repeated reading of a book you have already completed an IRA for. Repeated readings really help your students gain comprehension and understanding. I'm going to share with you 4 (you get a bonus) important reasons. I will explain how I plan and implement them in another post. Today's focus is on WHY you need to do them. 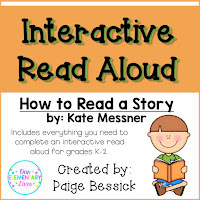 The first reason you NEED to be doing Interactive Read Alouds is because it supports the curriculum. You can do an IRA with any book you want and that includes books that support reading, writing, math, science, social studies or any other subject you teach. You name a subject, you can complete an IRA to support it. For example, if you're studying rocks in science, you may want to choose a nonfiction book about rocks. Nonfiction books are great for introducing vocabulary and identifying key points and details. Another example would be using a fiction book as a mentor text to teach reading. When you choose a quality mentor text to teach reading, you can demonstrate fluency, thinking aloud and how to use reading strategies. The possibilities are endless when it comes to IRAs and curriculum needs. One of my favorite books that support the curriculum in first grade is How to Read A Story by Kate Messner. It is perfect for reading and how to teach students what it looks like to independently read. It is also great for teaching "how-to" books in writing. I love this book because it does double duty and can be used to teach reading AND writing. The second reason you need to be doing Interactive Read Alouds is because it meets SO MANY standards. I teach first grade, so I'm going to mention those, but as you will see, it will meet many of the same standards at other grades as well. •Ask and answer questions about key details in a text. •Retell stories, including key details, and demonstrate understanding of their central message or lesson. •Describe characters, settings, and major events in a story, using key details. •Use illustrations and details in a story to describe its characters, setting, or events. •Compare and contrast the adventures and experiences of characters in stories. •Participate in collaborative conversations with diverse partners about grade 1 topics and texts with peers and adults in small and larger groups. •Build on others' talk in conversations by responding to the comments of others through multiple exchanges. •Ask questions to clear up any confusion about the topics and texts under discussion. •Ask and answer questions about key details in a text read aloud or information presented orally or through other media. Just look at all of those. Are you doing anything else in your classroom that has the possibility of meeting ALL of those standards in one activity? I DON'T THINK SO. This is probably the biggest reason you need to be doing IRAs consistently. You will find that as you continue to do IRAs, you can make the questions harder and your students become better at discussing and answering questions. Seriously, it is such a great activity! Another reason you need to be doing Interactive Read Alouds is because of how much it helps comprehension. Especially at first grade, so much of what we teach our students is figuring out tricky words. If you use Lucy Calkin's Units of Study for Reading, you know what I'm talking about. So many of the lessons are geared towards figuring out tricky words. Of course, you throw in some reading strategies, but the books my students are reading at levels D-J just don't have a lot of meat to them and deeper comprehension can be tricky to get at. That's why when you're planning and doing IRAs, it's important to take into account the LISTENING level of your students. They will probably be able to understand books levels K-M or even higher towards the end of the year. To really teach comprehension and the strategies involved with understanding a book, you need to have more of a plot line than Biscuit books. Don't get me wrong, I love me some Biscuit! But to really dig deep in comprehension AND touch on the standards as mentioned above, you need books with a deeper plot line like Clifford or Kevin Henke's books. And your BONUS reason for why you NEED to do Interactive Read Alouds is engagement. Plain and simple, Interactive Read Alouds are FUN! Like I said before, they are one of my favorite things to do and that is partly because the kids enjoy them so much! Who doesn't love having a book read to them and getting to talk about it in the middle? Gone are the days where teachers read aloud and kids are silent. To get the most out of a book, the students need to be interacting and that means providing opportunities for engagement. And don't forget about the constant thinking aloud and discussion you are having throughout the entire book as well. From: A Guide to the Reading Workshop-Primary Grades by Lucy Calkins. Chapter 3: What Does Research Say that All Readers Need? Essentials for Reading Instruction: Learners need opportunities to talk in response to texts. Remember the book I mentioned above as being one of my favorites for IRA? You can find it below. 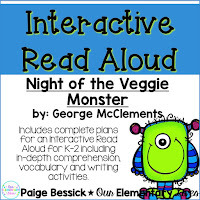 You can find my other Interactive Read Aloud Product by clicking HERE or the images below. 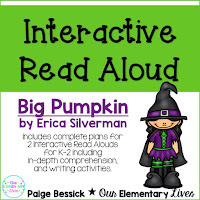 You can also get more information about Interactive Read Alouds from this FREEBIE! Click HERE or on the picture below. If you liked this post, please make sure to pin it so others can see it too! 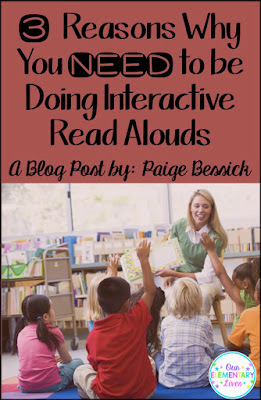 So, I hope I have convinced you on why you NEED to be doing Interactive Read Alouds. If you are already doing them, please share with me some of your favorite books. If you are not, can you share with me why you have been apprehensive about it? 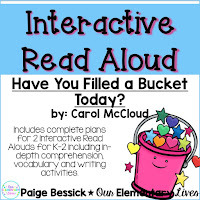 Stay tuned for another post about how I plan and implement Interactive Read Alouds in my classroom. I'll be doing my IRAs differently this year so that my mini lesson stays mini. I actually have 2 read aloud times because I love them and they are so beneficial. Can't wait to read how you implement them. Hi Marlene, I do my IRAs during another time too to make sure my mini lessons are mini. I will definitely pull out a book and refer to it, but I will not read more than a page or two during a mini-lesson. I'm so glad you feel the same way! Thanks for commenting. Could you both please share your schedules? I'm very interested in seeing how I can fit in IRAs in my day! Thanks so much! Kelli, can you email me at ourelementarylives@gmail.com so I can share my schedule with you. We have 90 minutes for our reading block everyday. I schedule it in that block or will often do it during snack time too. It's a priority for me so I make room for it. The ONLY way to make a mentor text meaningful, in my humble opinion! Such a great post. I loveee interactive read alouds! This is an awesome post!!!! Thanks for sharing all of this wonderful information.